Get (cross) fit with us! We're partnering with CrossFit Hartford to host a CrossFit-based fitness program geared towards runners. Sign-up for an eight-pack of classes using the link above (each class offers full instruction so you can join in at any time). Don’t be intimidated by the word “CrossFit”. It is just a fancy name for a workout based on functional movements like squatting, lunging, pushing, pulling, hinging, twisting and walking. The basic movements of life. The movements you need to do if you want to live independently as you age. Yes, the workouts are high-intensity, but they are also quick (8-12 minutes) and produce a copious amount of post-workout endorphins that will leave you exhilarated. Plus, the coaches are truly incredible – knowledgeable, enthusiastic and encouraging. They will modify workouts to keep you safe so even if you have a knee, back or shoulder injury, you can still participate and get your fitness on. This fall we are offering two levels of programming: FUNdamentals of Fitness & Fit360. FUNdamentals of Fitness (formerly Couch-2-CrossFit): Perfect beginners - including those new to cross-training, returning to fitness after a year+ hiatus or just curious about CrossFit - as well as fitness veterans. Workouts focus on the basic movements, terminology and techniques of CrossFit without the heavy loads or advanced gymnastics. There are lots of partner-workouts to encourage camaraderie. This program is offered on Sunday's at 9am. Fit360: ﻿This high-energy class offers a unique blend of agility, strength and conditioning that will accelerate your training and are the perfect complement to any running program. 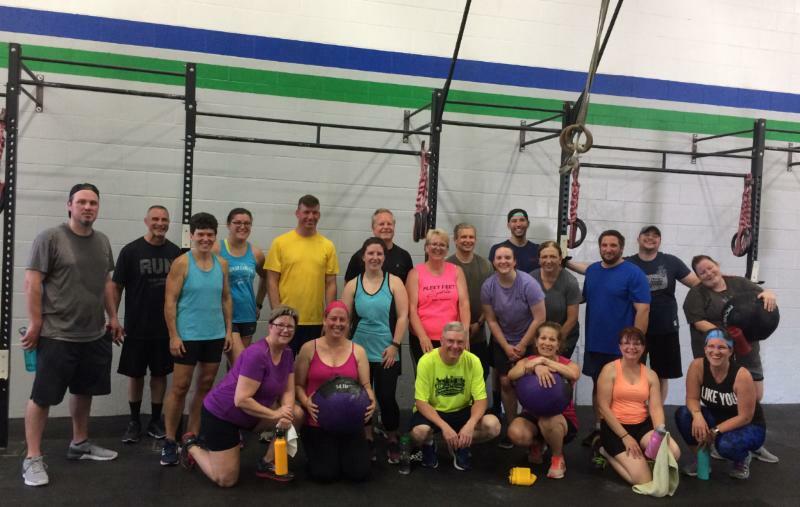 These classes are a bit faster paced than the Fundamentals of Fitness class, but you still don't need any previous CrossFit or cross-training experience - the coaches will teach you everything! Classes offered on Tuesday and Thursday's at 6:30pm. To get the most out of the program, you are encouraged to sign-up for both sessions. Click here for more details about this class. All of these classes lasts about an hour. Sometimes the workouts are done with a partner, other times they are performed solo – but always they are modified to your particular needs so that you don’t get hurt. The goal is to help you achieve your fitness goals whether it be to run a faster race, have the energy to keep up with your kids, carry your groceries into the house (in one trip!) or just be healthier overall so you can enjoy all that life has to offer. Join us! Description: Cross training is an essential element of running. Every movement you make starts from the core. Develop a strong core and you will not only see improvements in performance, but it can help prevent injury which allows you to consistently train harder and build upon your successes. Great things happen when you focus on becoming fundamentally strong.